This fantastic 16-day tour takes you into some of South India's most beautiful and ecologically significant wildlife destinations. Explore Mudumalai and Bandipur, go boating in Periyar, look out for the elusive Nilgiri Tahr in Eravikulam and see the Elephant herds of Nagarahole! Our South India wildlife tour begins in Kochi. You will meet our representative at the airport who will assist you in checking -in at your hotel. You can take a ferry around the harbor and relax in the beautiful environs of the hotel. Kochi is the spice capital of India, and a major port city. It was the first European colony and has been colonized by the Portuguese, Dutch and British. The remnants of the colonizers can be seen in the architecture at Bolghatty Palace, Dutch Palace, Jewish Synagogue, Chinese fishing nets and many more. Today, after breakfast we embark on a five hour drive to reach Periyar National Park. 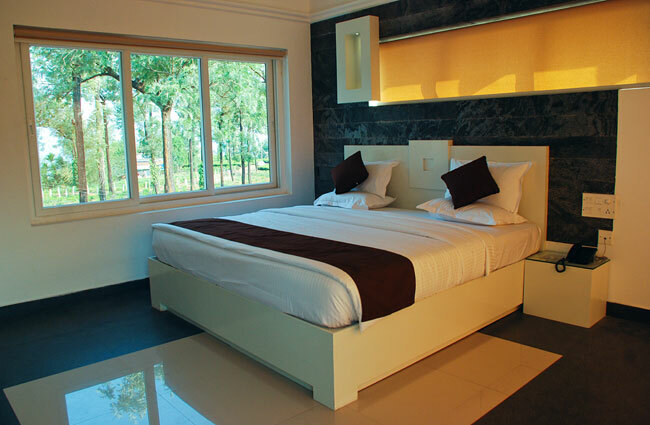 We will stay at the Aranya Niwas Hotel which is located inside Periyar Tiger Reserve in the Cardamom Hills. After lunch, we will visit a spice garden located near Periyar. We return to the hotel at dusk and you can relax and enjoy the serene forest surrounding the hotel. 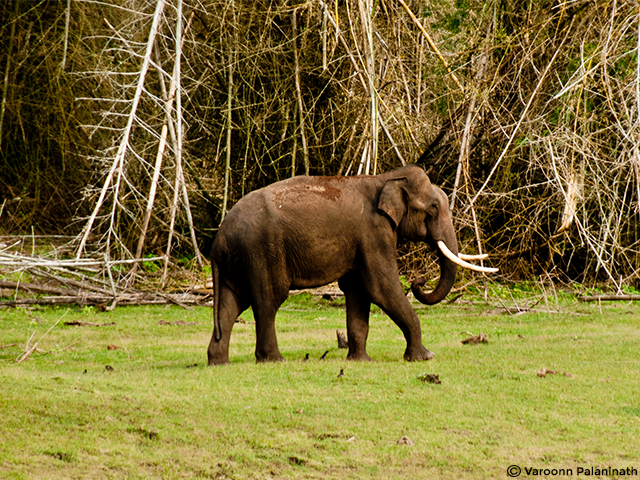 Periyar National Park is also one of the Project Tiger Reserves of India. It is considered to be one of the most picturesque and beautiful wildlife reserves in the world. In addition to the Tiger, Periyar is also home to the Indian Elephant, Gaur, Sambar (Horse Deer), Barking Deer, Mouse Deer, Dhole (Indian Wild Dog), Fox, Leopard and the elusive Nilgiri Tahr. We have two full days to explore this beautiful national park which is abundant with interesting flora and fauna. Today we begin early with an elephant safari in Periyar National Park. It is a popular way of exploring the forest, as we can go off the track and silently observe the animals in their natural habitat. We return to the lodge for breakfast and you can relax till it is time for an afternoon nature walk in Periyar. Nature walks provide a different insight of the forest as one can observe the plants and insect life up close, which might not be possible in a jeep or on an elephant. Our exploration of Periyar will end at dusk, and we return to the hotel for dinner. Today we go for an early morning boat ride on Periyar Lake. We hope to sight Elephants, Indian Bison and Sambhar grazing at the lakeside and getting their first drink of the day. The other animals to look out for are Otters and Wild Boar. Keep an eye out for Flamingos! We return to the lodge for breakfast. This is followed by an interesting Periyar National Park nature walk till it is time for lunch. You can spend the rest of the day relaxing or exploring your surroundings. Today we go on another early morning boat ride to hopefully sight more animals in Periyar. We return for breakfast, and head for Munnar (approx 4 hours drive), making a few birdwatching stops en route. 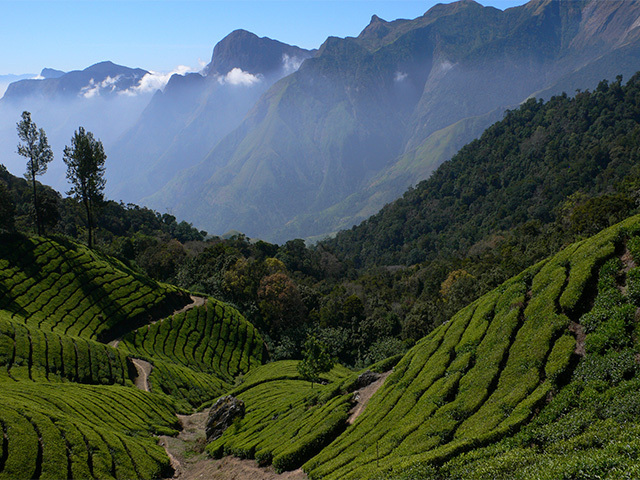 Munnar is a beautiful hill station and a major center of Kerala’s tea industry. The town is surrounded by about 30 sprawling tea estates where these precious tea leaves are picked, dried and processed into top quality tea. You are free to spend the rest of the day relaxing and soaking in the rejuvenating climate of the town. Today we plan to spend the entire day in Eravikulam National Park and start off for the park in the morning. As vehicles are not allowed inside, we will explore the area on a nature walk in Eravikulam. We return to our hotel in the evening for dinner. Eravikulam was established to protect the Nilgiri Tahr, an endangered species of mountain goat. It is the only mountain goat species found south of the Himalayas. Sure-footed herds of Tahr are quite elusive, but you may be able to get a good view of them as they graze the hillside vegetation. Eravikulam is a habitat for a variety of mammals that include the Nilgiri Langur, Lion-tailed Macaque and several endemic bird species such as the streaky brown Nilgiri Pipit and Blackbird. The Blackbird in particular looks very different from the familiar songster of Europe and is regarded by some taxonomists as a possible separate species. Today, we drive for about 4 hours to reach Indira Gandhi Sanctuary and National Park/Anamalai Tiger Reserve, often referred to as Topslip National Park. After lunch we will set out on a guided nature walk. Topslip is located in the heart of the Nilgiri Biosphere Reserve, about 800 feet above sea level on the Anamalai mountains. It is a part of the Indira Gandhi National Park and Wildlife Sanctuary, which is around 958 sq km in area. The park is home to a variety of animals that include the Tiger, Indian Elephant, Wild Dog (Dhole), Nilgiri Tahr, Lion-tailed Macaque, Mongoose, Gaur, Malabar Spiny Dormouse, Sloth Bear and Smooth-coated Otter. Today we visit Kolikamuthi Elephant Camp in the morning, which has been constructed exclusively to train Elephants. This area is also home to about 50 Malaisar tribe families who are professional Elephant trainers. We return to the lodge for breakfast. You can relax until after lunch, when we set out once again on a game drive to explore the area till dusk. Stay sharp! You might spot the elusive Leopard. You might even see a Tiger here. Today we go on an early morning walk in Topslip. Early mornings are beautiful in topslip, and its a wonderful sight to see the morning mist disappear and a perfect time to sight birds. After breakfast we depart for our next stop- Ootacamund (Ooty), which is known as the Queen of Hills. This is a drive of about 5 hours and is rather scenic! Once we arrive, you can spend the rest of the day relaxing or exploring your surroundings. Today after breakfast, we drive for about 2.5 hours to reach Bandipur National Park. 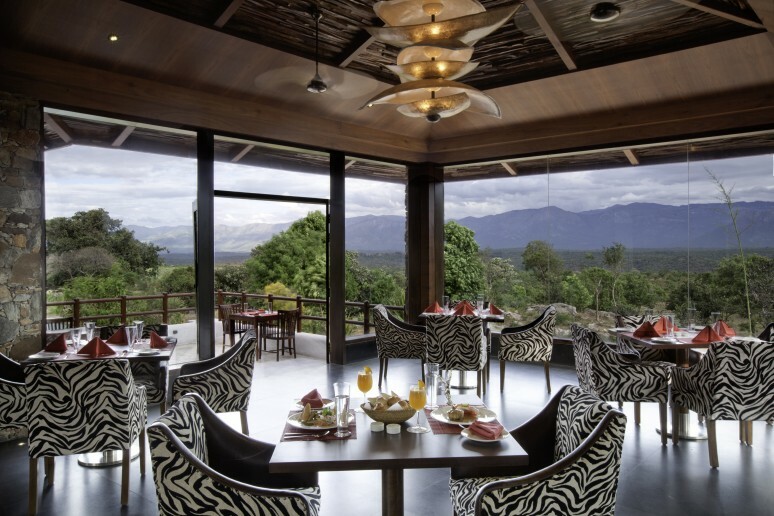 We check in at the resort and have lunch, which will be followed by a game drive in Bandipur National Park. The safari will acquaint you to the park's environment, as you will spend the next few days in Bandipur. Bandipur National Park is one of the best-known protected areas in India and is also a Project Tiger reserve. The park is famous for its Bengal Tigers, Asian Elephants and for the abundant sandalwood trees. In addition, it is also home to Leopards, Sloth Bears, Panthers, Chevrotains, Dholes (Wild Dogs), Hyenas, Gaur, Sambar (deer), Chital, Wild Boar, Barking Deer and Mouse Deer. Our day begins with an early morning Bandipur game drive. The greenery and landscapes of Bandipur are quite mesmerizing. If you are lucky, you may spot a Tiger! We return to the lodge for breakfast and you are free to spend the rest of the day relaxing until it is time for the afternoon game drive. Late afternoons and evenings are great to sight wildlife and birds. It is also a good time to click photographs! Today, we go on one last game drive in Bandipur and return to the lodge for breakfast. We will then head for Mudumalai National Park, which is only 15 kilometers away. Mudumalai is an important wildlife habitat due to its strategic position between several other protected areas that are a part of the Nilgiri Biosphere Reserve. The animals found here include the Asian Elephant, Tiger, Leopard, Gaur, Hyena, Sloth Bear, Sambar, Chital, Muntjac, Wild Boar, Nilgiri Tahr, Porcupine and Giant Flying Squirrel. In addition, 8 percent of the bird species in India are reported in Mudumalai Wildlife Sanctuary. On arriving in Mudumalai, we go for a nature walk inside the park. We stop to have our packed lunch, after which we go on a game drive. We return to Bandipur for the night. Our day starts with a morning drive followed by breakfast at the resort. We then set out for Nagarahole National Park (approx 3 hours drive). We will go on an afternoon game drive after lunch to familiarize ourselves with the park's environment. We return to the resort at dusk for dinner. We begin the day with a morning game drive into Nagarahole's wilderness. We set out at dawn and during the game drive, you will witness the park's unspoiled wilderness in the form of serene forests, bubbling streams and a tranquil lake. We may also get to see herds of Elephants on the river bank. We return to the resort for breakfast. The rest of the morning will be spent on a nature walk, during which you will have ample opportunity to take some great photographs. After lunch, we will set out once again to explore Nagarahole. Today we go on our final game drive into Nagarhole, we hope to see Elephants, Spotted Deer and Langurs on the way. We return to the lodge for breakfast and then drive for 2.5 hours to Mysore, where we will be staying for the night. After checking-in to our hotel, you can spend the day relaxing or explore this wonderful city. Mysore is the second largest city in the Indian state of Karnataka. It was the capital of Kingdom of Mysore and ruled by the Wodeyar dynasty. The majestic Mysore Palace was the home of the Wodeyar kings and is worth a visit. You may want to try a famous regional sweet- the Mysore Pak. In the evening, we will visit the Brindavan Gardens to enjoy a musical fountain show, after which we return to our hotel. This is the last day of your South India tiger safari holiday. After breakfast, you will be driven to Bangalore airport to board your flight back home. The drive from Mysore to Bangalore airport takes approximately 4 hours.